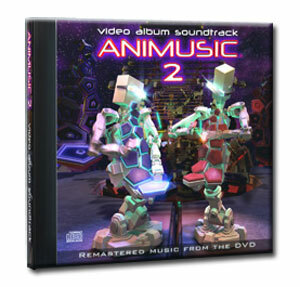 Enjoy the music from the Animusic 2 DVD. This audio CD contains all eight pieces from the DVD, plus three additional tracks. The music is re-mastered for optimal CD sound. The music on this CD is re-mastered from the tracks on the Animusic 2 DVD. For most pieces, the mix is the same as onthe DVD. For "Starship Groove" and "Pipe Dream 2", I removed the sound effects (ship engine rumble for the former, pneumatic air-rushing sound for the latter) for a clearer listening experience. In other cases I left them in because they added to the atmosphere of the piece (e.g. "Pogo Sticks" and "Heavy Light"). Unlike a couple of pieces on Animusic 1, all of this music was custom written for the graphical instruments (or custom-arranged, in the case of "Pictures"). The structure and models were largely complete when I was composing, so I had a clear visual of what it seemed like they would play. This put some constraints on the composition process, which isn't necessarily a bad thing. For instance, each instrument has a certain pre-determined set of notes it can play. So if a bass instrument has only eight notes, I can't use nine. Another constraint concerns how fast a given instrument is capable of playing, or how many notes it can sound simultaneously. The bonus tracks on this CD are sub-mixes from two of the animations. They are really intended for musicians to jam over, or play around with in some other way. I don't expect everyone to want to listen all the way through including the sub-mixes, although of course you can. I actually enjoy listening to the first two submixes quite a bit, as they expose more of what's going on rhythmically in the original pieces.